Many of you already know Kahli Abdu, the Nigerian born voca list, emcee and performer based in Washington D.C. You have heard him on M.I. 's Illegal Music Mixtape, his own mixtape The Grind Theory, as well as the single Fool's Song an in-studio effort with Tosin Arisibala (Femi Kuti & his Positive Force). 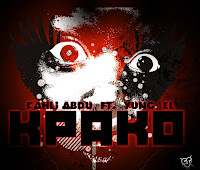 Track Title: Kpako feat.Young EL, produced by E Kelly, Kahli's first Official single off of his up-coming mixtape Ministry of Corruption (M.O.C. ), in which every song will sample the legendary Fela Kuti.